Thyroid, Parathyroid, Adrenal, Endocrine Surgery, What are cell surface receptors and second messenger systems? Most types of hormone are not fat-soluble. This means that they cannot dissolve in the cell membrane to gain entry into the cell. 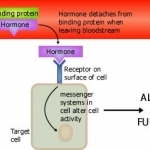 Instead they are transported around the blood, normally on transport proteins (such as albumin), to the target tissue where they bind to receptors on cell surfaces. These are protein receptors that sit in the cell membrane, with an extracellular domain and an intracellular domain. The peptide chain that forms the protein always spans the membrane. When the hormone binds to the extracellular domain, this causes a change in shape of the receptor (a conformational change). This causes the intracellular domain to activate G proteins. G proteins have 3 main parts: an a subunit, a b subunit and a g subunit. When activated, firstly the a subunit substitutes a GDP molecule for a GTP molecule. This results in the activation of the G proteins. They can be either stimulatory or inhibitory i.e. they can cause an increased level of enzyme activity or a decreased level of activity in the second messenger systems. These enzymes are generally involved in the phosphorylation of proteins (so-called kinase activity). 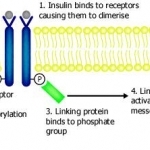 An example of one type of these is the tyrosine-kinase receptor for insulin. Here, once insulin binds, the intracellular domain is activated resulting in the dimerisation of (the fusion together of) two receptors. A kinase enzyme on one of the two receptors phosphorylates the tyrosine amino acids of the other receptor, a process called transautophosphorylation. Other intracellular proteins that recognise the phosphorylated dimerised receptors bind to them. These proteins activate second messenger systems. These are systems within the cell that are activated upon stimulation of the receptor. They act to amplify the signal. 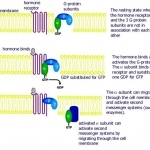 Although only one hormone molecule can stimulate one receptor (at any one time), the stimulated receptor can produce multiple second messengers, each of which can stimulate other molecules within the cell. One hormone molecule can therefore cause a large effect. This accounts for the fact that concentrations of hormone in the blood are so low. 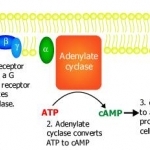 cAMP is produced from ATP (adenosine triphosphate) by the enzyme adenylate cyclase. Adenylate cyclase can be stimulated by several mechanisms. The enzyme is activated by stimulatory subunits of G proteins and other proteins activated by phosphorylated enzyme-linked receptors. It is inhibited by other inhibitory G proteins. cAMP goes on to activate other enzymes which affect the expression of certain genes in the cell. IP3 and DAG are produced from another molecule PIP2 (phosphatidylinositol 4,5 -bisphosphate) by the enzyme phospholipase C. Phospholipase C is activated again by stimulatory G proteins and other proteins activated by phosphorylated enzyme-linked receptors. 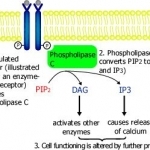 IP3 goes on to release calcium from intracellular stores. Calcium together with DAG can then go on to activate other enzymes (such as protein kinase C, PKC) which in turn activate proteins that alter cell activity.